Description: BNSF 7619 is sitting at the crew change point at North Nowers. Description: 6 brand new BNSF GEVOs trail on a westbound CSX manifest heading through Pine Junction, heading for Clyde Yard. Description: A BNSF Tier II Evolution DC locomotive pulls alongside with it's stack train. Description: A blast from the horn and the Tier II powers up and moves west. Description: As the Tier II passes by, the bridge can be seen in the distance. 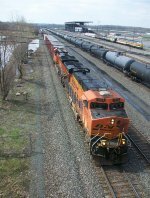 Title: BNSF ES-44DC #7619 leads this eastbound into the yard at Ross Ave. Description: Southbound loaded C-KCWE coal train tackles the steepest part of the grade up Rich Mountain near Stapp, OK. Description: Northbound coal empties enter the yard at Heavener for fuel and a crew change. Description: A swoosh heads into Northtown. Description: Date Approx. Salvage from an old CD of shots I never uploaded. Description: BNSF H3 ES44DC 7619 heads towards Clyde with its eastbound stack train. Description: Nice clean consist. The sun was kind enough to linger around for this train. Description: The MAC trailing died at Galesburg therefore the C-JRMPED had a boring old GE leading. Description: Eastbound mixed freight at CP291. Description: It's nice to see foreign power on the water level route! The K680 is stopped on the siding here. They entered the siding at CP296 shortly before the Q626-23 showed up!